The Red Sox' five-game victory over the Los Angeles Dodgers averaged 14.1 million viewers, the Nielsen company said. That's sharply down from the 2018 Fall Classic, which averaged 18.9 million viewers for the Houston Astros' seven-game triumph over the Dodgers. The ratings drop likely had more to do with the length of the series than the matchup. 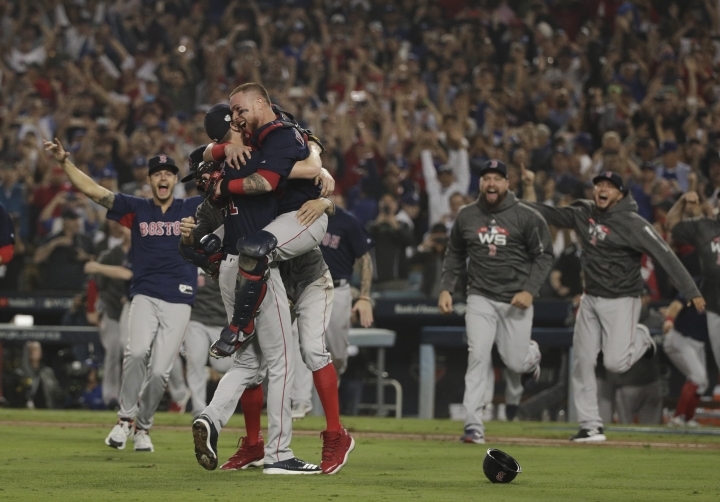 World Series games tend to draw in more viewers as the series goes longer, and the broadcasting network usually hits the jackpot if it goes a full seven games — like last year's series. Between the series and Thursday night football, Fox was the week's most popular network with a prime-time average of 13.1 million viewers. NBC had 6.53 million viewers, CBS had 6.49 million, ABC had 4.2 million, Telemundo had 1.4 million, Univision had 1.3 million, ION Television had 1.2 million and the CW had 1.1 million. Fox News Channel was the week's most popular cable network, averaging 2.56 million viewers in prime time. ESPN had 2.18 million, MSNBC had 1.5 million, Hallmark had 1.35 million and USA had 1.26 million. ABC's "World News Now" topped the evening newscasts with an average of 8.4 million viewers. NBC's "Nightly News" had 8.2 million and the "CBS Evening News" had 5.8 million. For the week of Oct. 22-28, the top 10 shows, their networks and viewerships: World Series Game 5: Boston at Los Angeles, Fox, 17.63 million; "The OT," Fox, 15.74 million; "World Series Game 5 Pregame," Fox, 14.9 million; NFL Football: New Orleans at Minnesota, NBC, 14.09 million; World Series Game 1: Los Angeles at Boston, Fox, 13.81 million; World Series Game 4: Boston at Los Angeles, Fox, 13.56 million; World Series Game 2: Los Angeles at Boston, Fox, 13.51 million; World Series Game 3: Boston at Los Angeles, Fox, 13.25 million; "The Big Bang Theory," CBS, 13 million; NFL Football: Miami at Houston, Fox, 12.09 million.